In Feb I rolled my left foot at home causing what I thought was an ankle sprain. When I went to see my doctor I explained to him that the pain I have is on the inside ankle area he ordered an X-ray. Unfortunately X-ray showed nothing, so he ordered a CT scan. 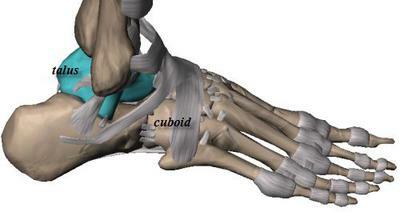 It showed a non displaced fracture at the cuboid bone. After having a slab cast on my foot and X-rays again, the doctor was happy that the cuboid bone was healing properly so next was to start physiotherapy. So I started physiotherapy and after 3 weeks, with still pain in ankle, swelling in the foot that made it look like a football and had a hard time moving my toes, my physiotherapist recommended that I get an MRI. My doctor ordered the MRI. Report came back saying that the talus appeared to have a fracture. So went to see my orthopedic doctor and he said that there is not a fracture at the talus, but gave me a prescription for a lot of pain meds and anti inflammatories and said to go back to my physio. So I showed him where my pain is and now has ordered a bone scan. He also mentioned quickly that he thinks I might have nerve damage but called it some name that I can not remember. I am getting very frustrated cause it feels I am not getting any better and nobody seems to know how to help me. I have a couple of questions that need to be answered. First, if you stated your ankle pain is on the inside of the ankle (which is the side closest to the other foot), then how did they diagnose a fractured cuboid which is a bone on the outside of the foot. I assume you know inside from outside, so I am confused. Most ankle sprains are known as inversion sprains where the foot bends inwards and you essentially stretch all the structures on the outside of the foot and ankle and conversely jam the structures on the inside of the foot and ankle. So a fractured cuboid certainly is one possibility. Secondly, you do not mention how long you were in the cast and whether or not you were weightbearing or non-weightbearing using crutches. So as you can see I have these two issues to deal with in trying to give you some guidance. Additionally, I do not know if you are male or female, athletic, your age, smoking habits, or if you are overweight, etc. All these come in to play in trying to determine why it may be taking so long to heal. two diagnoses is because with all things being equal, those two fractures might take the longest to heal. I agree with whoever has ordered the bone scan as that may be more definitive in determining if there is a fracture or not. The reason that is important is because a fracture in the talus bone can be an issue, even if it is non-displaced. The reason for this is because the blood supply to the talar neck is very poor and fractures there can take a long time to heal. I would also want to know the status of the cuboid. Many times in an ankle sprain you can end up with what is know as a subluxed cuboid, meaning the cuboid bone has moved out of place, ever so slightly, but enough to yield pain and still not show up on x-ray. So in theory at least, you may have fractured your cuboid, BUT, it may also be subluxed which might account for the pain on the outside of your foot. Now, if you have a subluxed cuboid or a talus fracture, physiotherapy may actually have aggravated it and that might account for why this is taking so long to heal. For example, giving you exercises to perform and not knowing about a talar fracture of subluxed cuboid could aggravate these two conditions. There can be other factors, but I do not know enough about you. I guess from this point on in your care my approach would be as follows. If the bone scan is "hot" meaning there is a probability of a fracture, I would put you back in a cast, preferably non-weightbearing. Secondly, I would look into a bone stimulator which is a device that helps fractures heal more quickly. This would be especially helpful for the talar fracture (if there is one) for as I previously mentioned, they can be difficult to heal. If the bone scan is normal, then I would have the cuboid examined for subluxation and if found, have the bone positioned back into place through manipulation and stay non-weightbearing perhaps for three weeks. To further complicate your situation, your doctor has suggested the possibility of nerve damage. I would assume he referred to it as "complex regional pain syndrome", sometimes known as reflex sympathetic dystrophy or even causalgia. I would say if your overall pain is worse today then lets say two months ago, then this condition has to be ruled out. This too, is a difficult diagnosis to make and is best made by a neurologist or an anesthesiologist who deals in pain management and has experience with this type of problem. From someone on the outside looking in, if no pathology (fracture or subluxed cuboid) can be confirmed then nerve damage may be the source of your problem. Do not delay in getting an examination for this because it is a condition that is best treated sooner, rather than later. Comments for Ankle pain with lots of swelling. Thanks for getting back to me. So for taking so long to reply. I am a non-smoking male, 46 years old, weighing in at 250 lbs. yes my ankle pain is on the inside, & the cat scan showed the cuboid bone being fractured. Unfortunately, the orthopaedic doctor felt that was the only issue even when I said that the pain was on the inside ankle. After 2 weeks of walking on it with, the orthopedic doctor put a slab cast on my foot for three weeks. No weight bearing. Went back in four weeks to follow up with the doctor. He said he was happy with how the cuboid was healing and should start physio. I asked if I should have a MRI just to check and he said no, that I have a lot of soft tissue damage. So I started physio. After 3 weeks of physio, my physio therapist was concerned due to the swelling was not going down and I was not getting any better. My therapist gave me a note to give the doctor on my visit and he said for me to get stockings to help with the swelling and continue with physio. I then went to see my family doctor to request a MRI and he agreed. He also recommend a walking cast until I see another orthopaedic doctor, with MRI results. The radiologist that read the MRI called a fractured talus, the orthopaedic doctor says it is not. When I asked what is causing the pain the my ankle, all the swelling of the foot and causing the first 3 toes not to move, he then decided to order a bone scan. I just heard today from the doctors office today, and my scan is on Wednesday. The doctor said that I might have nerve damage, and gave me a prescription for pills for the pain and swelling and said to me that if it is nerve damage I might have to live with it. I was not happy with that answer so I am going to get a third opinion. It seems like your physical therapist was the only one who was really on top of this. I obviously cannot make any diagnosis, but one thing that concerns me is if you are having nerve issues with your toes and pain on the inside of the ankle, you should as someone to check your for tarsal tunnel syndrome. You can read about it on my site. Getting another orthopedic opinion seems like the proper thing to do.